Beautiful & Long Lasting Redwood Frame - Redwood is a natural insulator and does not require any special treatment to ensure its long life. Resistant to insects and fungus, redwood is a great framing choice. Double-Wall Polycarbonate Panels - This covering: will not crack or shatter, retains heat in the winter, diffuses light for even plant growth, and blocks 98% of the harmful UV rays. The impact strength of polycarbonate is 30 times greater than acrylic, and 200 times greater than glass. Temperature Control - Each kit includes automatic vent openers for each vent. No batteries or electric supply is required. The hydraulic cylinder is filled with wax, which, when warmed, expands pushing open the vents. They close automatically too. More Room - The sidewalls and roof peak are tall providing more growing space, head room and protecting plants by capturing hot air well above growing plants and providing room for hanging baskets. Sidewall height is 5' 9" for all models. Peak height is 8 1/2' for the 6' wide models and 10' for 8' wide models. A Roof for All Seasons - The 45 degree pitched roof captures more light in during those short winter days when the sun is low on the horizon. It also reduces the accumulation of snow. Maximized Air Flow - Not only is there a vent at the top of the roof, but also at the lower back to let cool air enter and create cross air circulation. Rot & Insect-Proof Base - The base is made of a recycled plastic that looks like wood and that allows you to build your Sunshine greenhouse directly on the ground without concern. No additional foundation is required. Dutch Doors - Not only is the door attractive, it provides a safe additional vent for extra air flow when needed. Door is 28" wide and 78" tall. Doors are now available in both end walls instead of rear wall base vent(s) at no extra charge. (Does not include extensions unless purchased with a Sunshine greenhouse) Greenhouses are shipped by freight truck and delivered in 3 to 5 weeks. 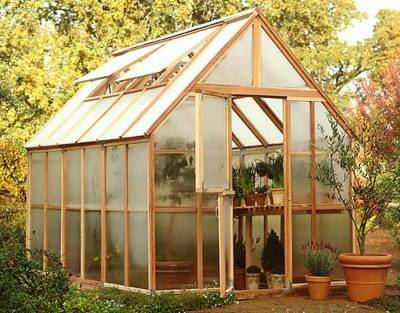 Up to 4 benches can be placed in a single Sunshine greenhouse. 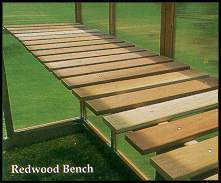 Benches can only be used with the greenhouse model specified in the description. Please call for shipping rates if you plan to only purchase benches.